Since the 1940s, Australia’s defence scientists have established an enviable reputation as world leaders in fatigue-testing work on defence platforms. The earliest major contribution in the aeronautical field was the pioneering work of Arthur Wills of the Aeronautical Research Laboratory, (a former part of the DST Group) at Fishermans Bend. Wills recognised the importance of fatigue in aircraft and especially the effect of stress concentrators, such as bolt holes and cut-outs, on fatigue life. He initiated a research program in 1947 to develop a database on fatigue. In 1949, he presented a seminal paper entitled The Life of Aircraft Structures which explained, for the first time, the technique of determining aircraft fatigue lives using applied loads and fatigue data. In 1950, Alf Payne and W.W. Johnston led a pioneering research program into the fatigue behaviour of aircraft structures. Over 12 years, 222 Mustang aircraft wings were tested under repeated loads and a complex series of loads representing the load history of an aircraft in service. This program was the most extensive series of fatigue tests of a full-scale structure ever undertaken, and the 1960s saw Australia become the world leader in aircraft fatigue research. flight-by-flight fatigue testing on a Nomad airframe. DST has continued to undertake testing of aircraft and helicopter airframes and components such as the CT-4 trainer aircraft, the Nomad and the F-111 aircraft. The full-scale structural test of the F/A-18 A/B Hornet has been recognised as an outstanding example of international cooperation in the field of aeronautics. After discussions between DST's Chris Rider and Dave Simpson of the National Research Council, Canada, at a panel meeting of the The Technical Cooperation Program (TTCP), the Royal Australian Air Force (RAAF) decided in 1988 that a full-scale structural test on the empennage of the F/A-18 Hornet was required to establish its economic safe life. This led to the International Follow-On Structural Test Project (IFOSTP), a joint venture between Canada and Australia. Canada tested the centre fuselage and wing and provided much of the flight test data for the Australian aft fuselage and empennage test. 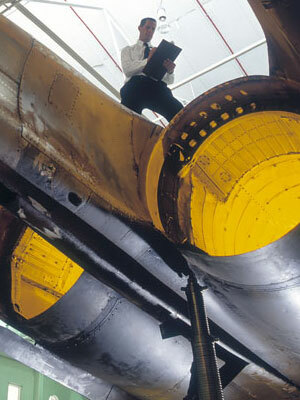 Australia, in return, provided most of the flight test data for the centre fuselage and wing. A new empennage and rear fuselage section were purchased at a cost of $A9.3 million by the RAAF while the Canadian Forces retired an aircraft from service for their program. Under Project Manager David Graham, the IFOSTP was DST's biggest fatigue project to date. Full-scale testing of major components commenced in 1995 in Melbourne, involving 24,000 hours of test ‘flying’ in a specially designed rig that duplicated the stresses and loads of real flight. Along the way, many new test techniques were pioneered and an invaluable set of operational data was collected to support the aircraft for RAAF service. Loris Molent took over the role of Project Manager in 2000. In 2001, DST, the RAAF and the Institute for Aerospace Research, National Research Council, Canada, were jointly awarded the prestigious Von Karman Award by the International Council of the Aeronautical Sciences (ICAS). Defence scientists have also made significant contributions to a major international collaborative effort involving full scale fatigue tests and associated analysis on the complete P-3 Orion aircraft. The P-3 Service Life Assessment Program, in operation since 2000, is enabling Defence scientists to provide data relating to flight load analysis, empennage fatigue testing, structural teardown and fatigue analysis that will enable the RAAF to safely manage the structural integrity of the fleet until the planned withdrawal date of 2018. The T56 International Spin Testing Program with Canada, USA and South Africa has also been assisted by DST expertise. Following testing on one of the Rolls Royce T56 engine turbine discs, the original safe life for the component was reinstated by the Original Equipment Manufacturer (OEM). This was perhaps the first instance where an engine OEM has extended the life of a critical component based on the results of independent tests conducted outside the US. DST is conducting fatigue testing on the Hawk Mk. 127 Lead-In Fighter aircraft. It is the largest full-scale fatigue test ever conducted by the organisation, in terms of number of load actuators. For his pioneering work into the fatigue behaviour of aircraft structures. For leadership management and technical expertise during the International Follow-On Structural Test Project (F/A-18 fatigue test). Presented by the International Council of the Aeronautical Sciences (ICAS). For his work on developing solutions to determine the fatigue life of aircraft and their structural components.